Received Sylff fellowship in 2003. Evgeny Kandilarov is a Bulgarian historian and an associate professor at Sofia University “St. Kliment Ohridski”, Japanese Studies Department. He received a Sylff fellowship in 2003 as a PhD student at Sofia University. Main areas of interest include modern and contemporary Bulgarian and world political, economic, and cultural history, focusing on the Cold War period, the Cold War in East Asia, Bulgaria and East Asian countries during the Cold War, the Sino-Soviet split and changes in the Cold War paradigm, and Japanese postwar development. He is teaching courses on: Bulgaria and Japan (Political, Economic and Cultural Relations); Japanese Modern and Contemporary Diplomacy and International relations; Japanese Technological and Innovation Development; Japanese Culture. 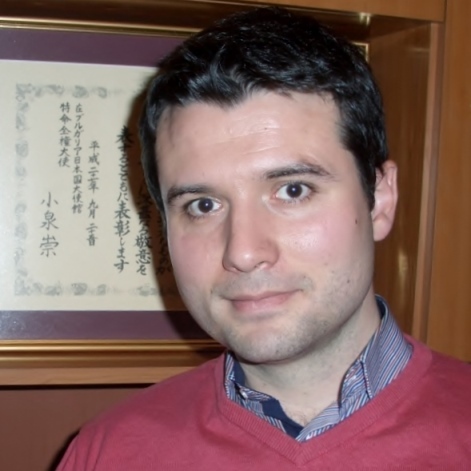 Evgeniy Kandilarov is author of the books: East Asia and Bulgaria. Sofia 2016, “East-West”Publishing House ; Japan – Economy, Technologies, Innovations and Management. Sofia 2012, “East-West”Publishing House (together with Prof. Nako Stefanov); Bulgaria and Japan. From The Cold War To the XXI Century. Sofia, 2009 “Damyan Yakov”Publishing House. In Sept 2015 Dr. Kandilarov received Certificate of Honor from the Ambassador of Japan in Bulgaria for contribution to introducing Japan in Bulgaria as an academic researcher, lecturer and author of books and papers.